NEW YORK (Reuters) - Global equity markets fell on Monday amid unease over the impact of the U.S.-China trade war on China's growth, while the dollar gained against the euro as Italian bond yields spiked on a brewing spat over Italy's budget plans. European markets slid, with defensive stocks under pressure as investor confidence took a hit from last week's spike in Treasury yields and heightened expectations for further U.S. interest rate hikes by the Federal Reserve. "Growth stocks are so sensitive to global growth expectations," said Chad Morganlander, senior portfolio manager at Washington Crossing Advisors in Florham Park, New Jersey. "Any time you see concern about that, you'll see the reversal of that trade." 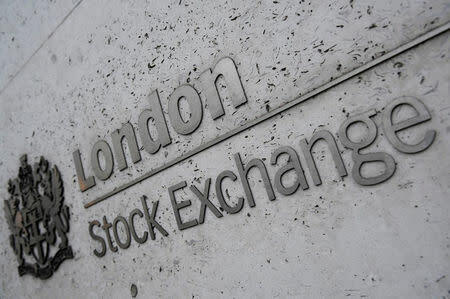 The pan-European FTSEurofirst 300 index of leading regional shares closed down 1.14 percent, its biggest one-day drop in a month, while MSCI's gauge of stocks across the globe shed 0.31 percent. The United States remains concerned about China's recent currency depreciation, a senior Treasury official said, adding that it was unclear whether Treasury Secretary Steven Mnuchin would meet with any Chinese officials this week. "There's a hangover from last week's rapid move in yields and just because the bond market's closed, doesn't mean investors are not worried," said Michael Antonelli, managing director, institutional sales trading at Robert W. Baird in Milwaukee. The yield on Italian government 10-year bonds rose more than 20 basis points to 3.626 percent, the highest since February 2014, while Italy's FTSE MIB stock index fell 2.4 percent to its weakest since April 2017. Italy's borrowing costs soared as a war of words between Rome and the European Union over the country's budget plans escalated, with the deputy Italian prime minister denouncing officials of the European Commission as enemies of Europe. Brazil's real currency hit a two-month high and stocks jumped after market-preferred presidential candidate Jair Bolsonaro's strong first-round win on Sunday boosted investor confidence. "We are seeing some strength in the dollar index and some weakness in the equity market and it doesn't appear that investors are going for safety in the gold markets at all," said Phil Streible, senior commodities strategist at RJO Futures in Chicago.